Class 302 – Overworked. Underfed. Anyone who’s anyone knows about the new shaved ice craze. 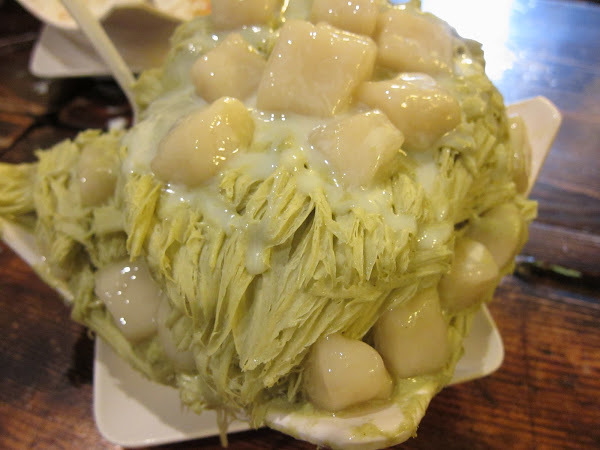 When you think about your traditional Chinese shaved ice, you think of a bowl of crushed ice doused in condensed milk, topped with a scoop of red bean goop. Then there’s the Korean version, which comes with all of the same plus a scoop of ice cream, maybe some canned mixed fruit, fresh strawberries if you’re lucky, topped with some fruity pebbles. 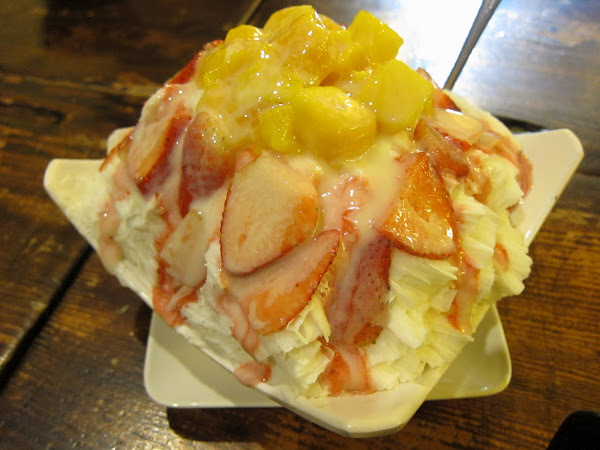 Then there’s the Guppy House version, that improved on the whole concept by using really fresh, and really good (especially when its in season) fruit like mangoes and strawberries (my fav!). The wait and crowds at Guppy House are just unbelievable sometimes, and the immaturity of the high school kids that frequent this place gets on my nerves sometimes. So the next reinvention of shaved ice, comes in the form of Class 302. I’ll admit that those Taiwanese people are a crafty bunch. First boba, now this?? What’s so special about the shaved ice here? Apparently, its more than just ice. It’s almost like a block of icey ice cream thats been frozen and then shaved off into sheets of folded fluffy soft creamy sweet deliciousness. The standard toppings apply. The strawberries were just ok, but it was the middle of January so what do you expect. The mangoes were super ripe and super sweet and kinda too soft so I wonder if it came from a can or something. I’m pretty sure if you had this version at Guppy House, the fruit would be 10x better. The green tea flavor was nice, but I’m not a huge fan of green tea flavored things. Triple T was really hoping this would taste as good as the version she had at Boiling Point. Unfortunately, it feel a little bit short of her expectations because it wasn’t creamy or sweet enough. Essentially it didn’t taste like shaved ice cream. The mochie here were ginormous, really dense, and way too filling. I never had the Boiling Point version so I’d still say this was tasty. Now don’t think Class 302 is the OG when it comes to this new fandangled version of shaved ice. Many years ago, I first tasted this at the now closed 85 Degrees Tea House in the SGV. It was amazing. It was like heaven in my mouth. I thought to myself, if I opened up a place and sold this stuff with fresh fruit toppings, I’d be a millionaire! Well it looks like Class 302 beat me to it. Their dinky, and frankly run down little cafe in Rowland Heights has now expanded to Irvine, and all I can think is “Ka-Ching! Ka-Ching! $$$$” for whoever owns Class 302. Despite Class 302’s success, I still believe there’s room to take it to another level. The fruit toppings were limited and disappointing because I expect Guppy House standards. And the shaved ice could have been smoother, creamier, and sweeter. All in all, the stuff is still good, but damn we had a to wait an hour for the stuff! There’s seriously only 10 tables or something and it was frankly miserable eating the stuff because the door would constantly open and the cold night air would swoosh on in. I hope the joint in Irvine is big spacious shiny and WARM!